Without Protect Mustangs’ and FoA’s successful 2015 lawsuit protecting the Pine Nut Herd from the roundup and forced drugging with pesticide PZP, this little foal and her band would have been chased by helicopters for miles. . . If she wasn’t abandoned then she would be ripped from her home on the range forever to live and nurse in a dirty pen with no shelter. A few months later she would be separated from her mama. This would be too early for a wild foal to be weaned. She would be separated from her mama forever at that point with no one to comfort her when she’s sad or scared. We are very grateful she was born in the wild. The lawyer will be the only paid professional at Protect Mustangs. The rest of us are volunteers because we care so deeply about America’s wild horses and their right to freedom. Most organizations are paying their Presidents and Executive Directors big salaries. They pay other staff good salaries and benefits too. At Protect Mustangs it’s different. We are here for the wild horses not for the paycheck. As you know I’m deeply committed to protecting America’s mustangs so I donate all my professional time as do our other wonderful volunteers. Sadly pro-bono lawyers won’t donate enough time to take a big case through the end. 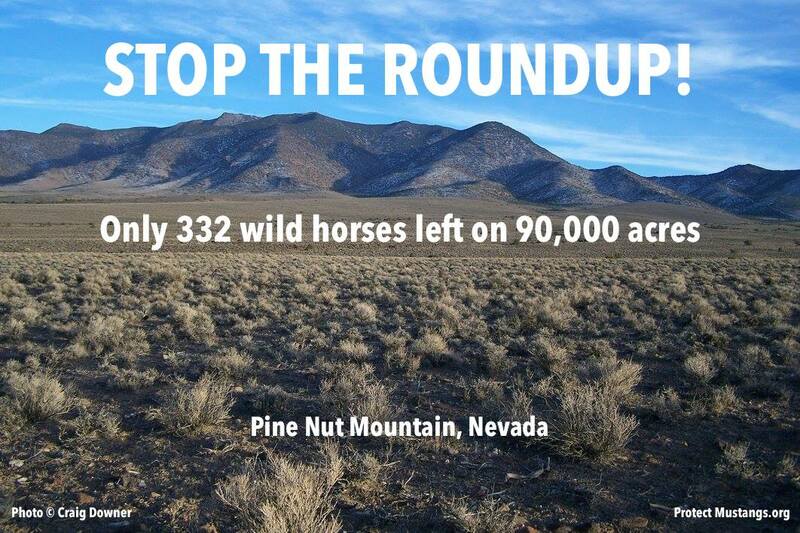 And we want to pound BLM with more than one lawsuit that will really protect wild horses. Time is running out . . .
Mustangs are being persecuted and forced off their legal land because greedy people want the resources and don’t care about wild horses. Roundups are cruel and deadly. 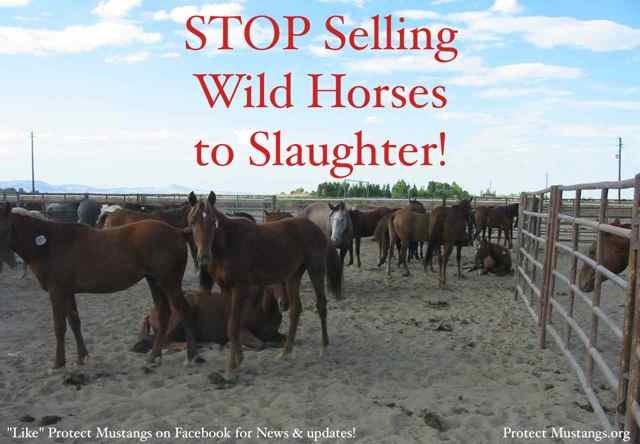 Afterwards wild horses are traumatized even more by being ripped apart from their families that they love. Once mustangs are offered for adoption 3 times by the feds and not picked–they can be sold to slaughter because the Burns Amendment made it legal. This is heinous! 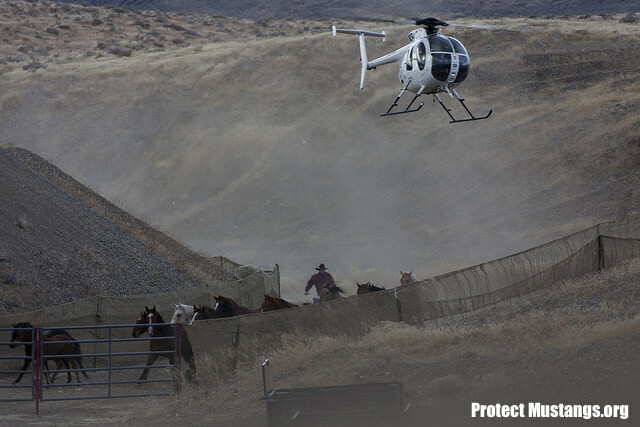 Protect Mustangs is a boots on the ground organization saving mustangs with a great track record of 3 out of 4 successful legal actions that have saved thousands of wild horses. (Pine Nut, Wyoming and Fort McDermitt). Now our hands are tied without our own lawyer on staff because there is so much to do! Urgent funds are needed for the lawyer to move forward. The $8,625 goal for the lawyer must be met by Friday at noon. Please help! 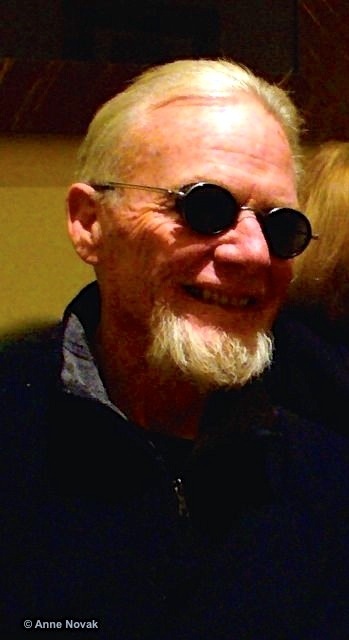 It is with great sadness that we mourn the loss of our dear friend and advisory board member, Michael Lennox Blake (Dances with Wolves). 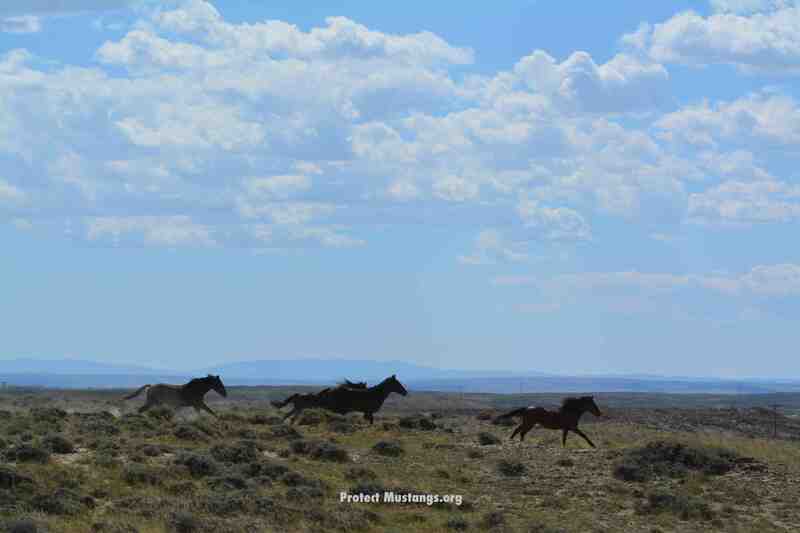 Now you can be with the wild horses forever and roam free. 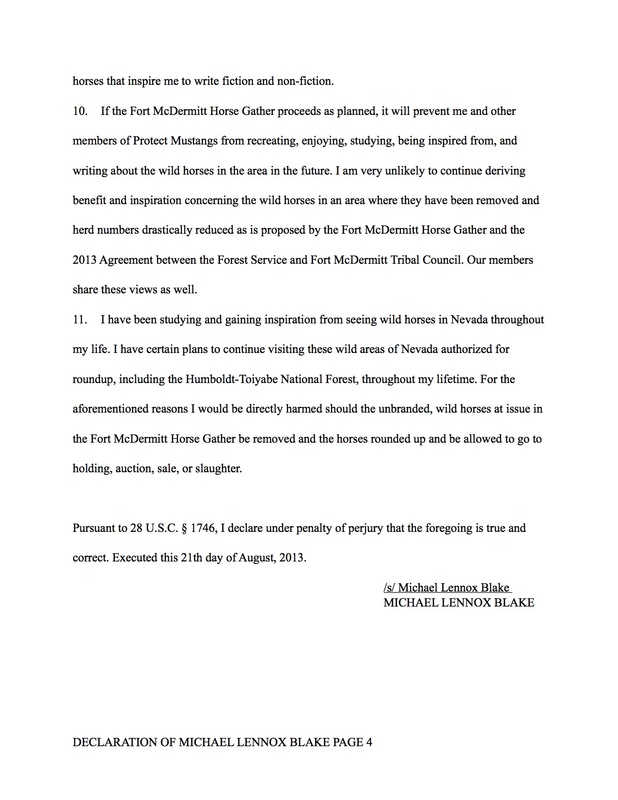 Michael Blake joined our 2013 lawsuit to stop the Fort McDermitt roundup with 2 years of slaughter bound removals. Despite our success for the past years, the tribe wants to resume roundups in August 2015. Lennox is a Fort Mc Dermit roundup horse who was brutally captured in 2013, injured in transport and then sold at a kill buyer auction in Fallon, Nevada where Protect Mustangs saved him. He is named after Michael Blake’s middle name with his blessing. 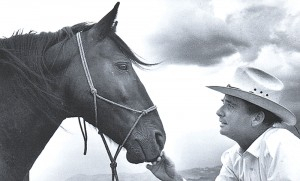 “Loving horses is essential for human life on this planet. For millions of years, horses assisted humanity but after cars were invented in America, America has fully destroyed them and continues. Though humanity is similar to all animals in terms of no full perception, the killing of them all is moving the earth to destruction. If we only kill those who attack us, humanity will keep the earth real for humans who follow us. 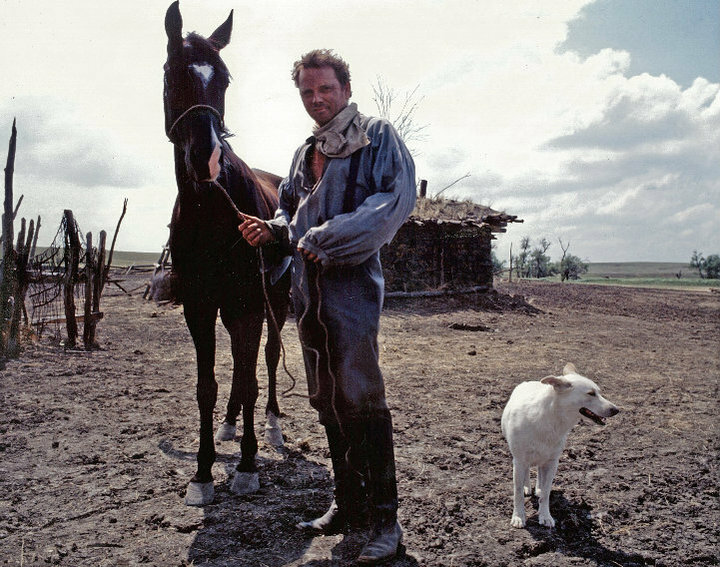 Like humanity, every horse is different but I have loved them most and have never killed one all my life.” ~Michael Blake, author of Dances with Wolves from Protect Mustangs’ Make Love not Roundups campaign. 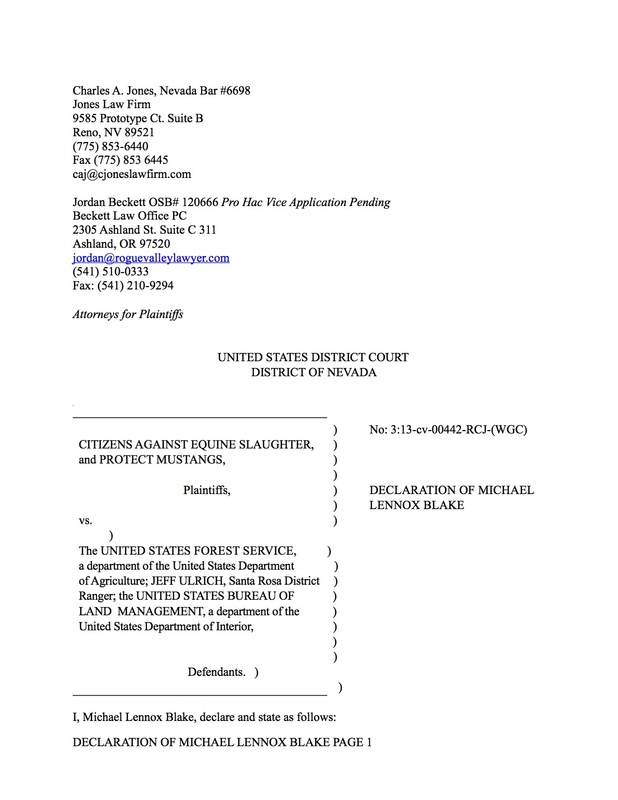 Reno, NV (Jan. 26, 2015)—Protect Mustangs and Friends of Animals (FoA) have filed a lawsuit against the Bureau of Land Management (BLM) to stop the round-up and permanent removal of 200 wild horses in the Pine Nut Herd Management Area (HMA) and the round-up of another 132 wild horses so that an estimated 66 mares would be forcibly drugged with the pesticide known as PZP for fertility control. 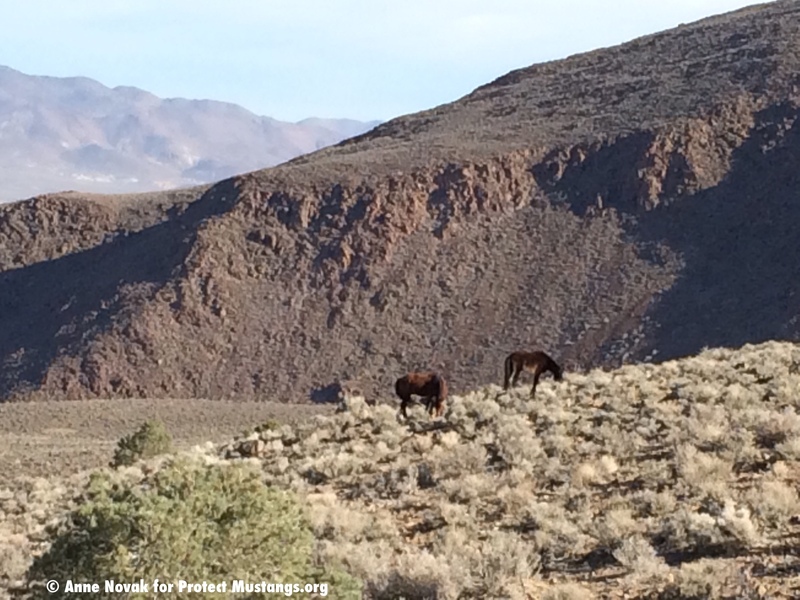 In addition, the groups plan to file a temporary restraining order—asking the judge for an emergency ruling so that the BLM can’t round up any horses or administer PZP until the court has time to hear FoA’s and Protect Mustangs’ case. The roundup is expected to last for 10 days and is slated for late January/early February. The lawsuit states that the defendants did not prepare an Environmental Assessment for the proposed roundup and instead relied on the 2010 environmental assessment for the Clan Alpine, Pilot Mountain and Pine Nut HMA Gather Plan, which does not take into consideration science that shows the negative side effects associated with PZP. Furthermore, the BLM did not solicit public comments. In fact, FoA employees traveled to Nevada on Jan. 22 to participate in a BLM public meeting regarding the Carson City Resource Management Plan, which includes the Pine Nut HMA, but the BLM denied the public the ability to comment. 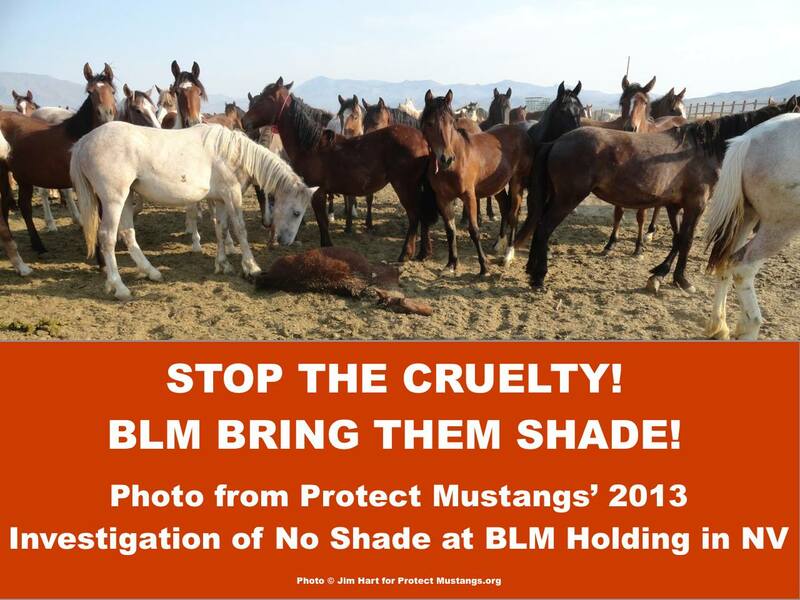 When Edita Birnkrant, FoA’s campaigns director, got up and spoke at the microphone anyways, she was silenced—BLM shut off the microphone and ejected her from the meeting, just like BLM removes wild horses from public land. FoA and Protect Mustangs oppose all roundups of wild horses and the use of PZP, which destroy family structure within the herds, and believe the Appropriate Management Levels set for the Herd Management Areas in all states are too low, outdated and do not accurately reflect the number of wild horses that are needed to maintain genetic viability to prevent extinction and to create a thriving ecological balance. The groups are adamant the BLM looks beyond data about PZP provided by the Humane Society of the United States, which has a vested interest in PZP as it is the registrant of the pesticide, and Jay Kirkpatrick, the director of the Science and Conservation Center, which produces the active ingredient in PZP. 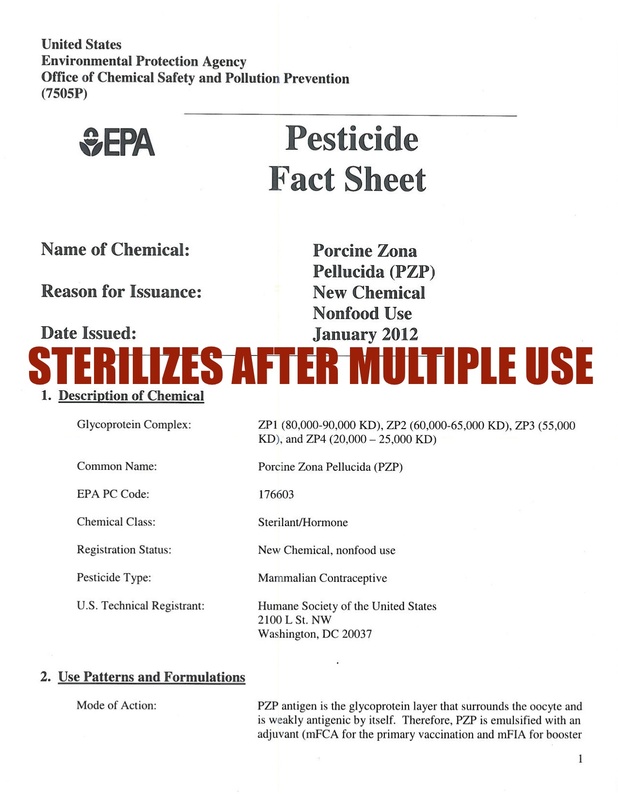 FoA believes the public needs to know there is a conflict of interest when it comes to PZP and it questions the motives of an animal charity pushing a harmful pesticide on wildlife rather than embracing holistic ways to manage public lands. Novak pointed out that according to the National Academy of Sciences’ 2013 report, there is “no evidence” of overpopulation. Ranchers scapegoat wild horses because they don’t want to share the public land they lease to graze their livestock. So they bully the Bureau of Land Management to remove wild horses. In Beaver and Iron County, Utah, where wild horses are scapegoated, data shows cows and sheep outnumber wild horses 10.6:1; in Oregon it’s 33:1. And prior to a massive roundup in Wyoming last summer, there were 356,222 cattle, 45,206 sheep, and only 1,912 wild horses. It seems that it’s easier for the BLM to accommodate ranchers and manage wild horses to extinction, than to consider holistic ways to manage our public lands. 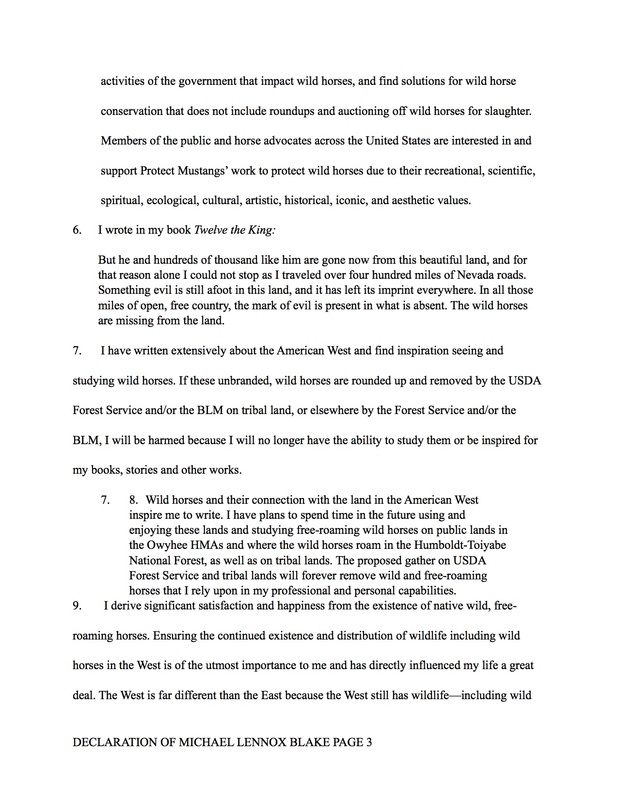 In his book, Downer, also the director of ecology and conservation for Protect Mustangs, advocates for reserve design , which involves utilizing natural and/or artificial barriers, natural predators, as well as community-involving buffer zones as a better way for BLM to manage public lands. Once available habitat is filled, wild horses, as climax species, would limit their own population as density-dependent controls are triggered. 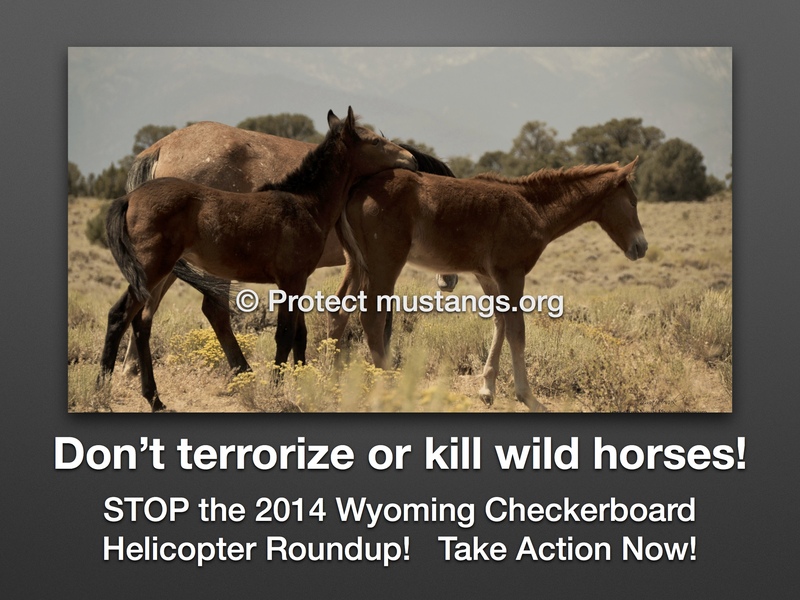 Cheyenne, WY (January 7, 2015)–On Monday, Jan. 5, 2015, the U.S. District Court for the District of Wyoming granted Protect Mustangs‘ and Friends of Animals (FoA) motion to intervene in the State of Wyoming’s lawsuit against the U.S Bureau of Land Management (BLM) to remove the last remaining wild horses from the state. 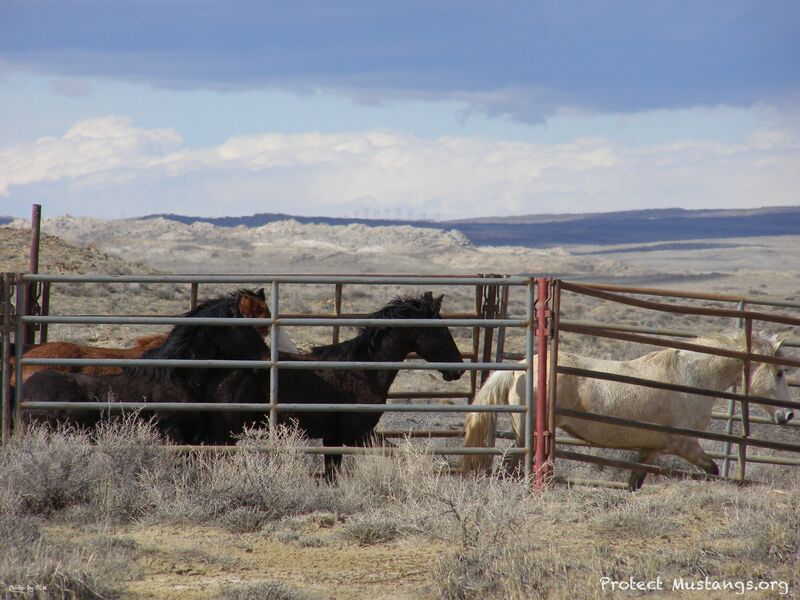 Wyoming alleges that the BLM has failed to take action on the state’s request to remove “excess” wild horses from the range in Wyoming and seeks the removal of hundreds of wild horses from public lands, where fewer than 2,500 wild horses remain. Unlike other wild horse advocacy organizations involved in this case, FoA and Protect Mustangs support the ability of wild horses to live freely, and oppose the use of PZP, the EPA pesticide, and other forms of birth control that are costly and risky to wild horse populations. FoA and Protect Mustangs, both non-profit animal advocacy organizations, and their members, have long-standing involvement in conserving wild horses in the western United States generally, and have specific conservation, academic, educational and recreational interests in wild horses in Wyoming. “We think both Wyoming officials and the BLM treat wild horses like snow removal, so we’re gratified that the court has granted us intervenor status to make the best case for protecting wild horses from the tragedies of roundups, PZP use, and disposal,” states Priscilla Feral, president of Friends of Animals. FoA and Protect Mustangs oppose all removals of wild horses and believe the appropriate management levels (AMLs) set for the Herd Management Areas in Wyoming are too low, outdated and do not accurately reflect the number of wild horses that are needed to maintain genetic viability to prevent extinction and to create a thriving ecological balance in the state. 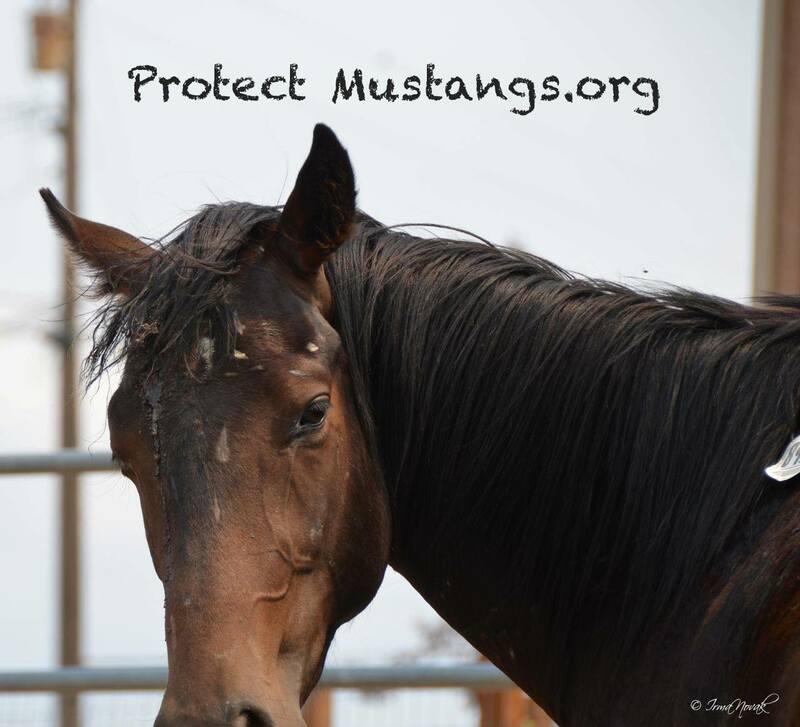 The Friends of Animals and Protect Mustangs motion to intervene has been granted in Case 2:14-cv-00248-ABJ State of Wyoming v. United States Department of the Interior et al Order. See below. Underpopulated national treasures at risk of being wiped out. Cheyenne, WY (December 17, 2014)—Protect Mustangs based in California and Friends of Animals (FoA) based in Connecticut have filed a motion to intervene in a lawsuit filed by the State of Wyoming against the United States Department of Interior and the United States Bureau of Land Management (BLM) to get even more wild horses removed from the state. The State of Wyoming alleges that the federal respondents have failed to take action on the state’s request to remove “excess” wild horses from the range in Wyoming. The organizations are concerned that the BLM has shown a willingness to settle actions seeking to force the removal of wild horses in Wyoming. For instance, this past summer, when Rock Springs Grazing Association filed a lawsuit against the BLM to force it to remove all wild horses from the Checkerboard area, a mix of federal and private land that runs along an old railroad route across southern Wyoming, BLM did not advocate for wild horse conservation. Instead BLM entered a consent decree with the plaintiffs in which BLM agreed to remove all wild horses from the Checkerboard area. FoA and Protect Mustangs oppose all removals of wild horses and believe the AMLs set for the Herd Management Areas in Wyoming are too low, outdated and do not accurately reflect the number of wild horses that are needed to maintain genetic viability to prevent extinction and to create a thriving natural ecological balance in the state. HELP us get to the Wyoming Checkerboard Roundup to WATCHDOG the situation and take action to prevent animal cruelty. 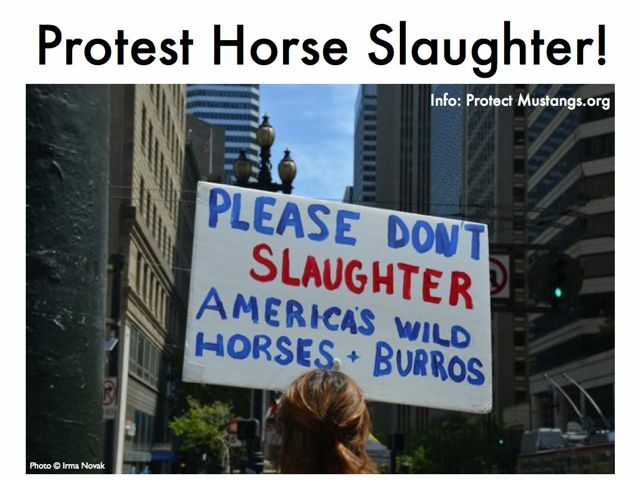 Please donate via www.PayPal.com to Contact@ProtectMustangs.org or by mail to Protect Mustangs, P.O. Box 5661, Berkeley, Ca. 94705 Mark “Watchdog WY” on your donation. Frequent flyer miles will help too. We also need a used mac laptop and camera for journey. Thank you so much! 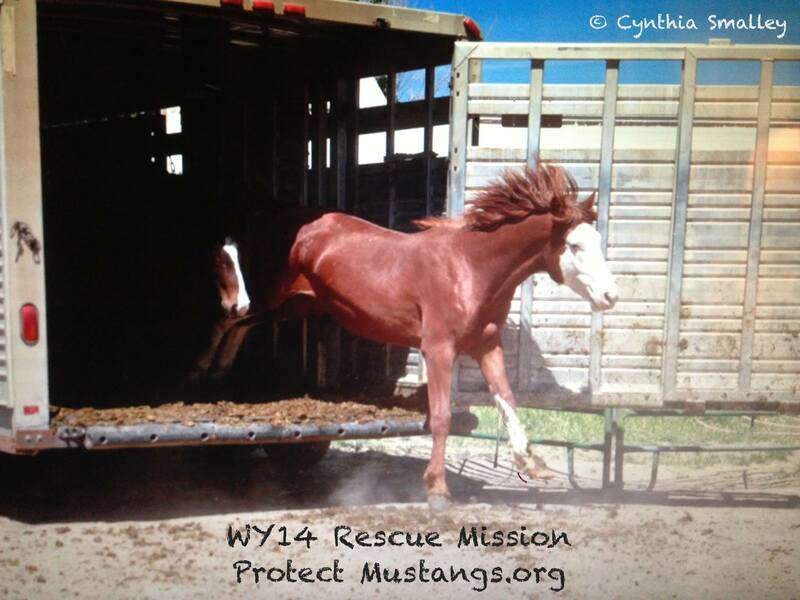 Sign up 4 Alerts: www.ProtectMustangs.org and PRAY for a miracle! 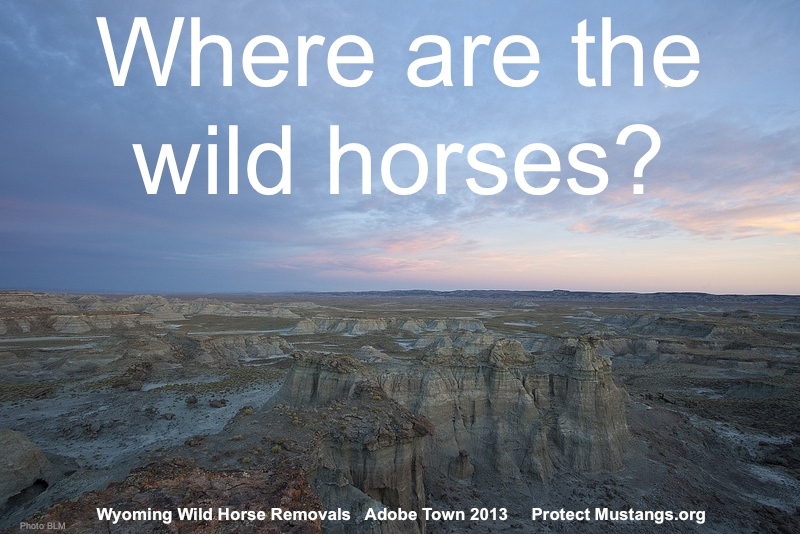 Follow https://www.facebook.com/ProtectMustangs for info and go to https://www.facebook.com/pages/Wild-Horses-In-Wyoming-Need-Help/587758424612113 to HELP the WY wild horses who will lose their freedom, their families and their place in the world in this heinous BLM roundup. 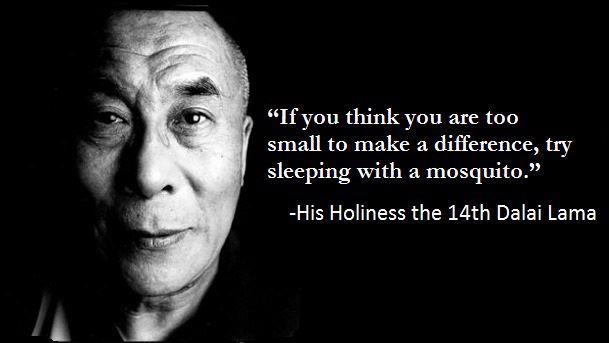 We are 100% volunteer nonprofit organization. When you give to Protect Mustangs your donations go directly to feed and care for rescued wild horses, field and watchdog work, gas and to keep the phone and internet on. 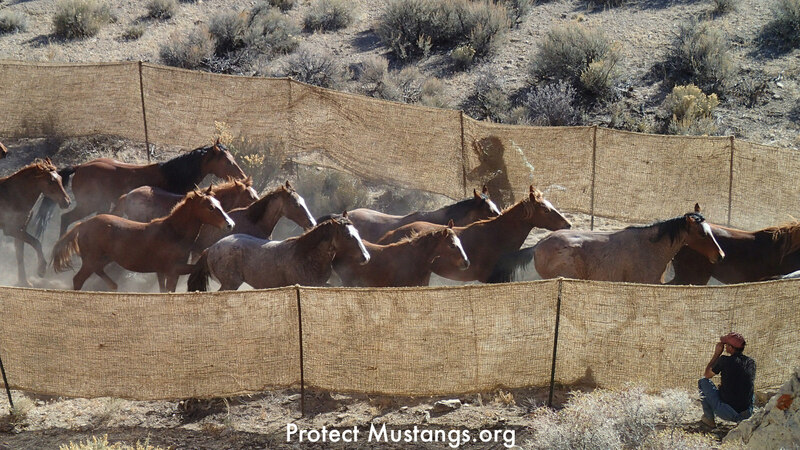 You can donate via www.PayPal.com to Contact@ProtectMustangs.org or by mail to Protect Mustangs, P.O. Box 5661, Berkeley, Ca. 94705 We are grateful for your support. You keep us going.